Adam Ingram-Goble began his work in gaming research with a M.S. in Computer Science where he focused in A.I. and Machine Learner models of human gameplay as instruments for understanding human learning. Realizing he needed a deeper understanding of human learning, he went on to a Ph.D. in Learning Sciences at Indiana University, where he worked on the Quest Atlantis. Ingram-Goble’s research projects thus far have explored game designs that facilitate critical dispositions in math, science, programming and game design as both academic disciplines and social practices. In 2011-2012, he worked with Prof. Katie Salen as a postdoc at DePaul University. 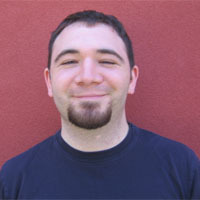 Currently, Adam is an engineer at Arizona State University Center for Games and Impact.